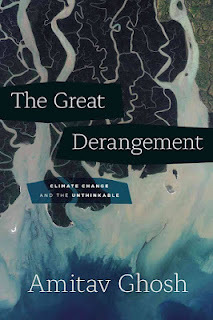 THE GENERALIST has spent Easter reading about Climate Change. Type those two words into the Search box of this blog and you'll find a large number of Previous Posts on climate change and related subjects - especially the new industrial revolution of sustainable energy systems, circular economies and other important innovations in both thinking and technology which are emerging as we face up to the realities of our existence or extinction on this planet. In fact I've been involved with these issues since the early 1970s when I saw Buckminster Fuller speak at the US Embassy in London, I had also interviewed Gaia pioneer James Lovelock in 1986, His vision of the total connectiveness of all the earth systems and all living species (including us) as a web prefigured what is now called Earth Systems Science. 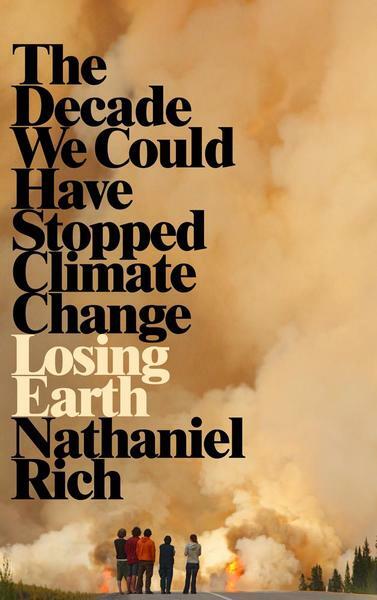 I worked on the first major Greenpeace campaign on global warming in 1992 and discovered how hard it is to alert people and convince them of the reality of this existential view of a forbidding future. I bought Al Gore lunch in London on the eve of the Rio Eath Summit in 1992 when we discussed global warming. I was working for the UK national press Sunday Times, The Observer, The Guardian and even wrote an Op-Ed piece for the New York Times on the environmental damage being wrought on the French Alps due to the Winter Olympics. I suggest that a new ring needed to be added to the Olympic symbol signifying Earth. 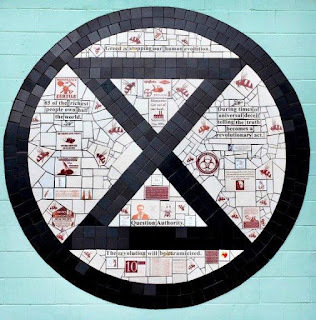 Energised by Extinction Rebellion's mainstream media breakthrough and the interesting tactics they were using I felt duty bound to spend some time revisiting the issue and bringing myself up to date with the latest info. Maybe this is a good time to look back on the history of how we got to this point. As so often happens with the internet, I found what I was looking for in spades. To start with, this essay published in 2017 is a useful 'in a nutshell' overview. A great starting point. "To a patient scientist, the unfolding greenhouse mystery is far more exciting than the plot of the best mystery novel. But it is slow reading, with new clues sometimes not appearing for several years. Impatience increases when one realizes that it is not the fate of some fictional character, but of our planet and species, which hangs in the balance as the great carbon mystery unfolds at a seemingly glacial pace." New York Times magazine devotes a whole issue to one feature. 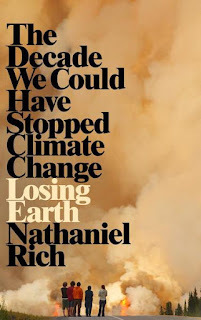 'Losing Earth: The Decade We Almost Stopped Climate Change' by Nathaniel Rich' which ran over 55pp in August 2018. A brilliant piece of work. It comes with this Editor's Note from Jake Silverstein. A great set-up for what is a stand-out piece. 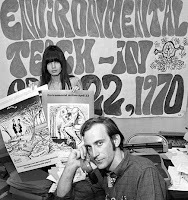 By portraying the early years of climate politics as a tragedy, the magazine lets Republicans and the fossil-fuel industry off the hook. based in Switzerland. According to Wikipedia, it consists of current and former heads of state, UN bureaucrats, high-level politicians and government officials, diplomats, scientists, economists, and business leaders from around the globe. to the environmental and demographic challenges ahead as long as fifty years ago. escalate, unless humanity radically changes course. and between nations, climate change is human society’s most pressing global challenge. 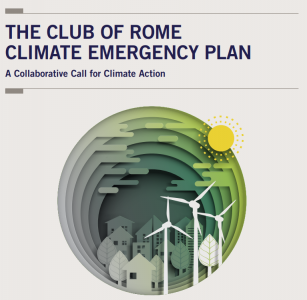 reduction targets and ensure climate stability. growth is the economic norm, and harmony is reached between humans and nature. Extinction Rebellion have created a paradigm shift in public awareness about climate change. For many in the UK it was blessed relief from wall-to-wall Brexit. We wait to see their next moves. The Generalist will continue to publish material of interest on this major issue of our times. "I gradually realised that the issue was so big that I couldn't do this alone, and therefore it needed something simple that anybody could easily replicate. I was really interested in the history of symbols at the time anyway, such as cave art symbols, runes, medieval alchemy symbols, the peace and anarchy symbols, etc. "My original hopes for it were that it would become widespread on the walls of cities as a kind of visual confrontation. A reminder to people who indulge in the hyper-consumerist lifestyle that their actions can have far reaching consequences, while also signifying the existence of an emergent resistance movement." In the late 1950s, the issue that brought marchers out in huge numbers was nuclear arms. In Britain the lead organisation was the Campaign for Nuclear Disarmament (CND). Their iconic logo was designed in 1958 by the late British designer Gerald Holtom (1914-1985).He hoped this graphic symbol would reinforce the mesasage of the protrestors who marched from London’s Trafalgar Square to the Atomic Weapons Research Establishment (AWRE) at Aldermaston, Berkshire. From this he finally settled on using letters from the flag semaphore system, superimposing N for 'nuclear' on D for 'disarmament' within a circle that symbolised the Earth. 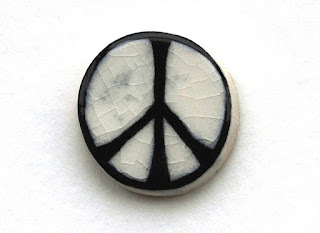 The CND symbol was transported across the Atlantic and took on additional meanings for the Civil Rights movement, the counter-culture of the 1960s and 70s including the anti-Vietnam protests, and the environmental and equal rights movements. Earth Day claim that more than 1 billion people in 192 countries now take part in what is the largest civic-focused day of action in the world. 'It is a day of political action and civic participation. People march, sign petitions, meet with their elected officials, plant trees, clean up their towns and roads. Corporations and governments use it to make pledges and announce sustainability measures. Faith leaders, including Pope Francis, connect Earth Day with protecting God’s greatest creations, humans, biodiversity and the planet that we all live on. Earth Day was founded by Gaylord Nelson as an environmental teach-in first held on April 22, 1970. Nelson later became a United States Senator and was later awarded the Presidential Medal of Freedom award in recognition of his work. 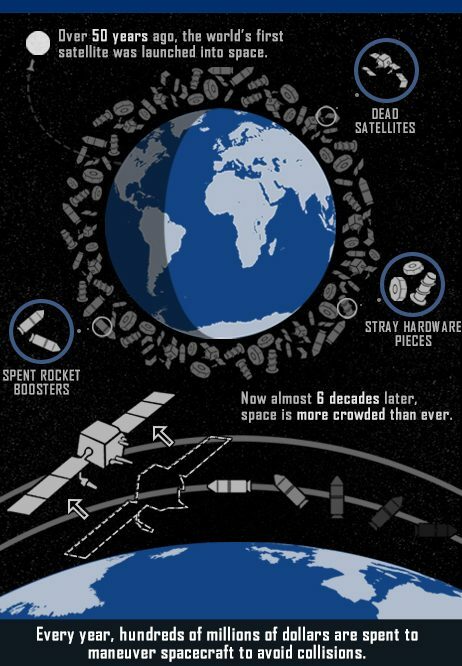 The issue of space junk has been around for a while but its changed its meaning and focus over the years. In the early Space Age days - Sputnik, the first satellite was launched in October 1957- there was some public concern reflected in the media about spacecraft boosters and defunct satellites falling back to earth. 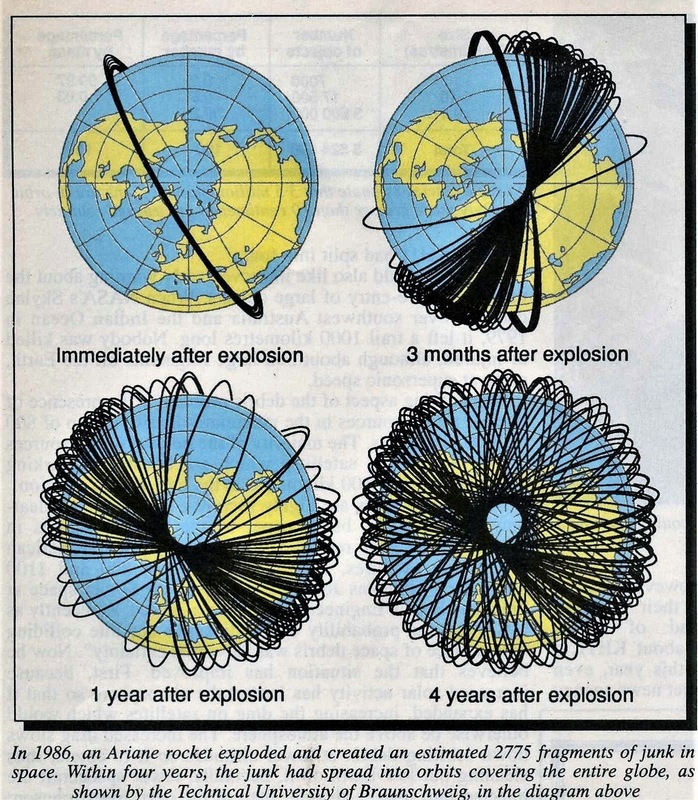 In fact this happened on a number of occasions [see chronology below] People were more concerned about the nuclear bombs exploding in the atmosphere and the threat of nuclear war. Fast forward to our current time and we've now got a different problem on our hands.Space is getting crowded with an increasing number of satellites in earth orbit, with more countries developing their own space programmes alongside billionaires who have their own privately- funded space travel plans. 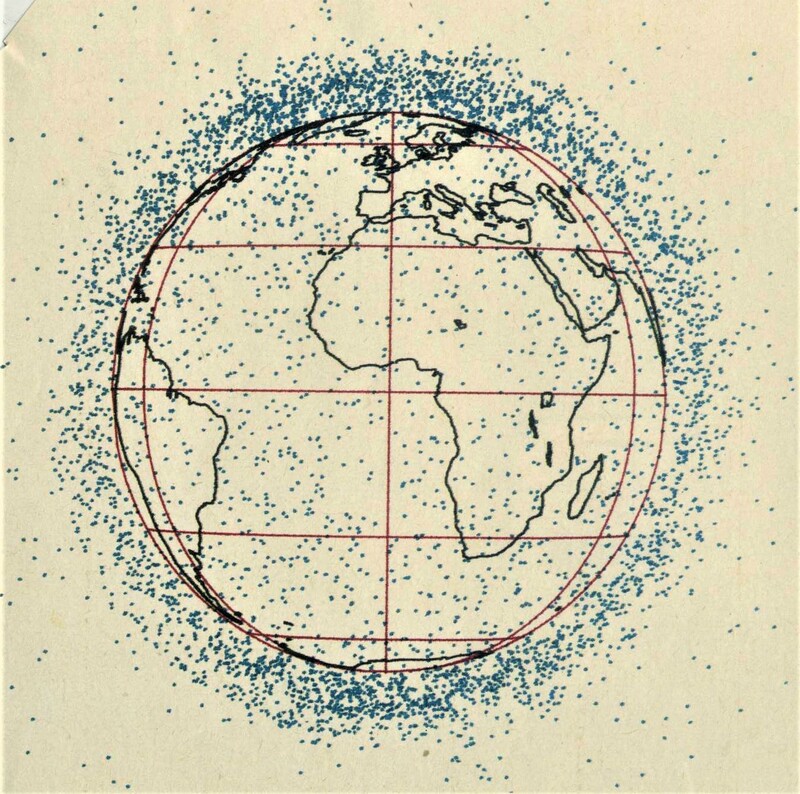 Space junk now principally refers to the debris of numerous explosions and accidents which has gradually accumulated over the last 50+ years. The larger pieces are easier to track and avoid but the main bulk is made up of small if not tiny flecks of metal or paint and other debris which can inflict real damage on satellites, the International Space Station (ISS), the Hubble Telescope and spacecraft. According to Michael Safi and Hannah Devlin's story on the incident in The Guardian the US military are currently tracking 23,000 objects larger than 10cm. 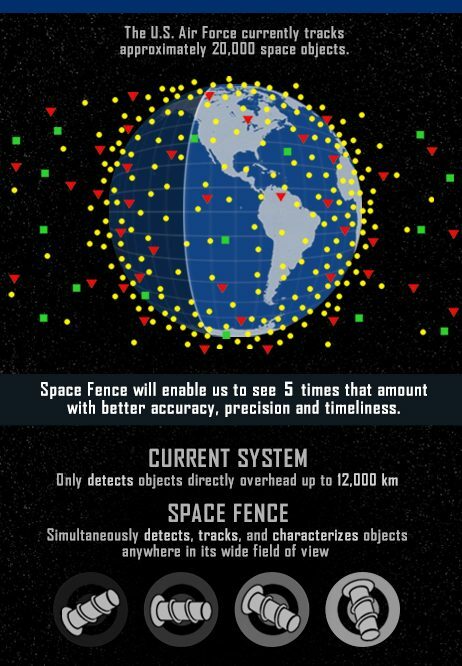 This includes 10,000 pieces of space debris. Nearly 3,000 of these were created in January 2007 when China tested an anti-satellite weapon on an old Fengyun weather satellite at an altitude of 530mls. The other biggest space junk incident was in February 2009, when an Iridium telecoms satellite and Kosmos-2251, a Russian military satellite, accidentally collided. In 2012, the crew of the International Space Station was forced to shelter in the Soyuz escape capsules when debris from this collision passed close by. 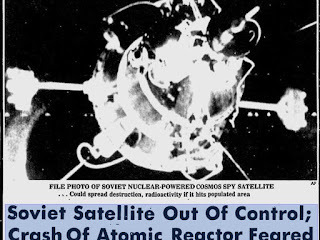 See also: 'Top 10 Space Age Radiation Incidents' by Patrick Weidinger [Jan 20th 2012] and 10 Eye-Opening Facts About Space Junk on the Listverse.com wensite. Experts are concerned that collisions will get more frequent, which could in turn trigger off a cascade effect with fragments creating further collisions as in the movie Gravity. European Space Agency (ESA) statistical models calculate that the Earth is ringed by 900,000 pieces of debris larger than a marble. 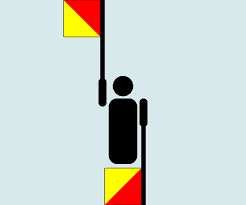 Some 34,000 of these measure more than 10cm. Satellites are getting smaller and cheaper to launch. Scientists, companies and even schools can build one to photograph Earth for as little as $10,000. On a larger scale, a number of major companies are seeking to build and launch internet constellations in what is turning into a battle of the billionaires. In 2018, Elon Musk's company SpaceX, based in Hawthorne, California, announced a project named Starlink which initially planned to launch a constellation of 4,425 satellites in low Earth orbit. 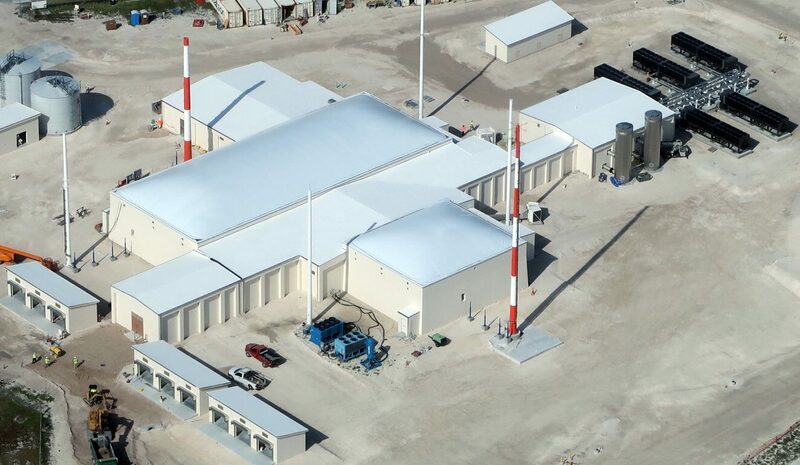 After the Federal Communications Commission (FCC) approved an additional 7,518 satellites late last year, SpaceX expanded the quota to 11,943 satellites. 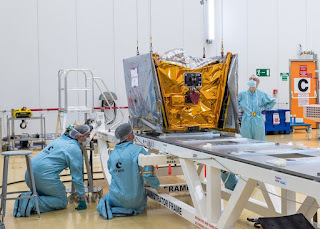 Only two prototype Starlink satellites have so far been launched. The FCC claims the project won’t be operational until at least 800 satellites are deployed. 'If all continues to go as planned, OneWeb’s first six spacecraft will finish on-orbit testing this spring, clearing the path for an initial system of 648 satellites — 600 operational and 48 spares — and setting the stage for a larger system that could eventually number 900 or more satellites. 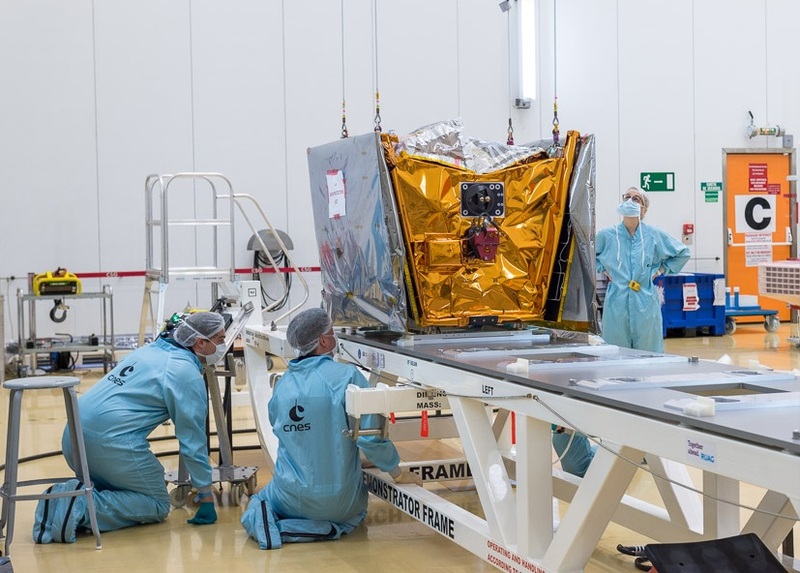 Telesat put its first prototype broadband satellite in low Earth orbit last year, and is planning on an initial constellation of more than 100 satellites, growing ultimately to 292 spacecraft. to provide first-generation broadband services in the early 2020. LeoSat Enterprises is planning to launch a constellation of 108 low-earth-orbit communications satellites which they claim will provide the fastest, most secure and widest coverage data network in the world. These satellites will be interconnected through laser links, effectively creating an optical backbone in space which is about 1.5 times faster than terrestrial fiber backbones. 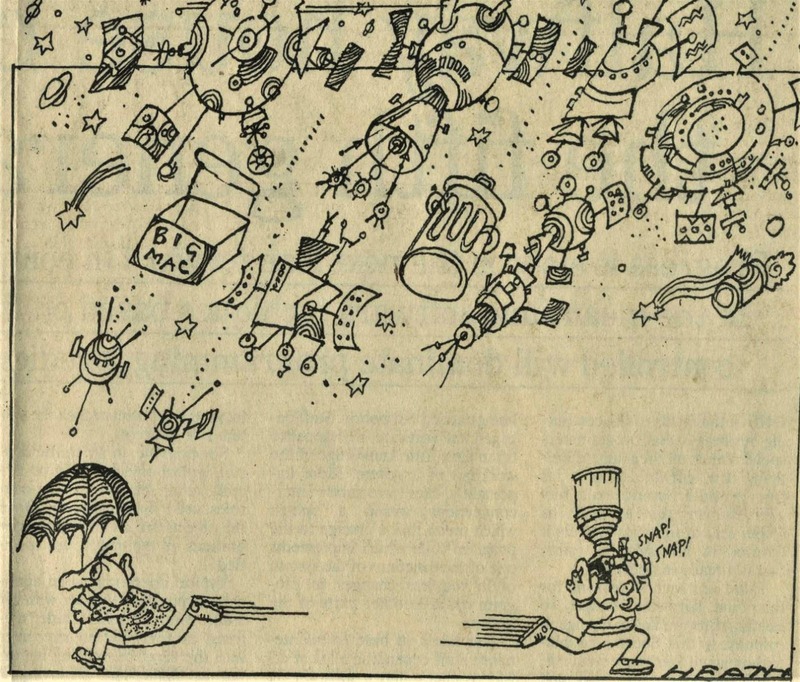 In an essay in Nature [27.3.2019] 'Four steps to global management of space traffic', Jamie Morin sets out the elements required to track satellites and avoid crashes. There are several strategies and tactics to try and deal with the problems of space junk. In an April 2018 speech, US vice-president Michael Pence announced that the Department of Commerce will take a lead in establishing common global practices to manage space traffic. IMPROVED TRACKING: 'Tracking space objects is technically difficult, especially if they are small and fast-moving. Objects can be as small as a fleck of paint or as big as a city bus. And most travel many kilometres each second, along orbits from 200 kilometres to 40,000 kilometres above Earth’s surface. 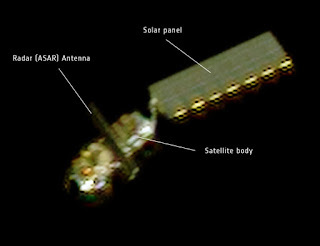 'Currently, the US military uses a website to publish extensive data for objects that are larger than about 10 centimetres (www.space-track.org). However, for every tracked object, there are 20–30 times as many pieces of debris. Most are too small to be followed, but many could end a mission if they were to hit satellite Ultimately, global sharing of tracking data is desirable, to make the best use of sensors around the globe. The prospects for international cooperation on tracking and management are constrained by geopolitical risks, in that some countries might not want to rely on the United States and would seek their own, independent data. 'Under the UN Convention on Registration of Objects Launched into Outer Space, governments are obliged to record new space objects. But this takes weeks or months, and lists are incomplete. the elimination of all on-board energy sources — from fuels to spinning momentum wheels — which will lower the risk of decommissioned satellites exploding. European Space Agency (ESA) Clean Space project called e.deorbit, was to capture a large defunct satellite from Low Earth orbit and then burn it up in a controlled atmospheric reentry. According to 'European Space Junk Cleanup Concept Gets New Mission: Refuel and Repair' by Tereza Pultarova [January 29, 2019] on the Space.com website. In December 2018, ESA officials announced their decision to refocus their plans as they were finding it difficult to raise the money for a single-case mission. The new concept of e.Deorbit is to build a multipurpose, in-orbit servicing vehicle that could be used to refuel, refurbish or re-boost satellites. 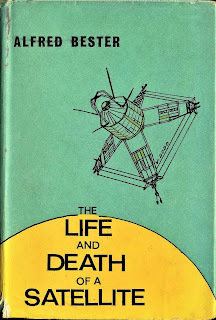 The oldest reference to space junk I've got in the Generalist Archive is a 1967 Scientific Book Club copy of 'The Life and Death of a Satellite' by the legendary sf writer Alfred Bester. His only work of non-fiction I believe. 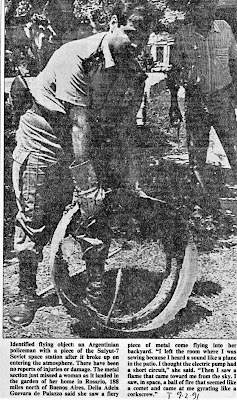 'Fidel Castro screamed that it was an act of outright agression when a launch from the Cape [Canaveral] misfired and landed on a Cuban farm. Africa received another accidental gift from the Cape; rocket casings strewn across miles of barren country. They raised hell,too. "But people will just have to get used to the idea that they're going to get hit by falling stages," Schindler said (Schindler is a. rocket expert at Goddard), "just as they're getting hit by falling planes. Fortunately a good proportion of the stages burnt out in the air, but within the next few years spent rocket and satellites are going to start dropping back to earth. Space people are worried about this." These fragments are already beginning to fall. They're called"decayed objects" because their orbits have decayed as a result of the earth's gravitational attraction which slowly pulls them down. When they reenter the atmosphere, the smaller objects burn up like meteorites. They don't come diving in; they skip in over the upper atmosphere, like a flat stone over water, which gives them time to burn, and gives rise to flying saucer reports featuring Little Green Men. All reports are processed by the Smithsonian Astrophysical Observatory. 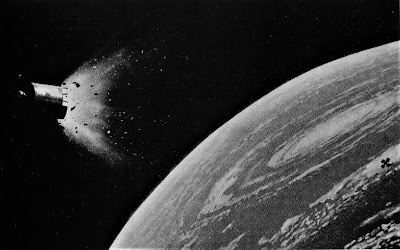 A Russian nuclear powered radar spy satellite C954 crashed onto the Northern territories of Canada on January 24th 1978, scattering debris over a 800km area. Its small nuclear reactor disintegrated. Contaminated snow and soil had to be scraped up by bulldozers, put in containers and taken to the Canadian Atomic Energy Board's radioactive waste disposal site. 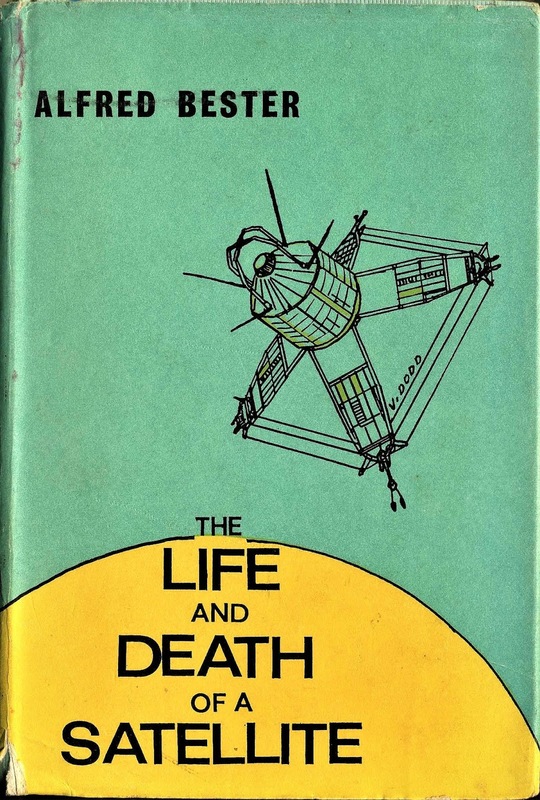 Illustration by William K. Hartmann is a noted planetary scientist, artist, author, and writer. He was the first to convince the scientific mainstream that the Earth had once been hit by a planet sized body (Theia), creating both the moon and the Earth's 23.5° tilt. 'The space age is only twenty-five years old but Earth's orbital space has already been turned into something of a junkyard. About 5,000 man-made objects are currently being tracked in Earth orbit. Only a small fraction of these are functioning satellites that carry such instruments as radiation detectors, atmospheric monitors, commu-nication relays, cameras, and mass spectrometers. Most are either no longer functioning satellites, burned-out rocket stages, or fragments from the breakup of rockets and satellites. No one knows how many additional man-made objects, too small or too high up to be detected, may also be circling the earth. Public attention has largely been focused on the presumed risk that these objects may fall to Earth, causing deaths and physical damage. 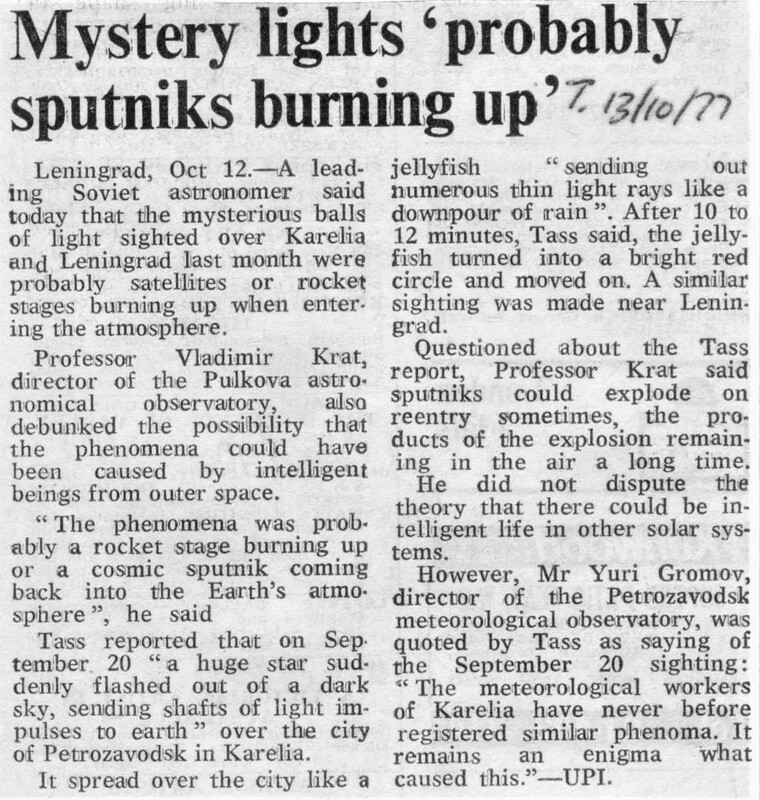 For example, when the nuclear-powered Soviet surveillance satellite Cosmos 954 reentered the earth's atmosphere over Canada in 1978, following a sudden depressurization, many feared that it might have spread radiation over that country. None was found, however. 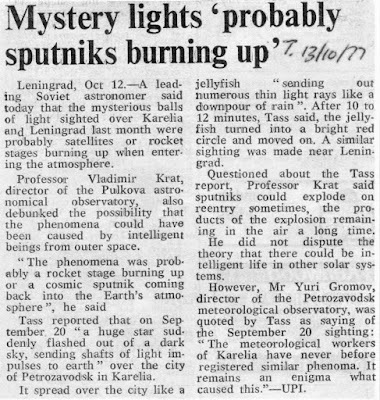 Similarly, there was much consternation in the summer of 1979 when, despite NASA's effort to cause the unmanned Skylab to fall into either the Indian or Atlantic ocean, the spacecraft reentered the earth's atmosphere over Australia. Even though it created a brilliant display in the Australian night sky, nothing on the earth was damaged as Skylab broke up in the atmosphere and pieces of it fell on the continent. Were we lucky? Not exactly. For purposes of comparison, the risk to humans on the ground is far greater from automobiles, airplane crashes, lightning, and other occurrences. Every year, between 500 and 1,000 man-made objects reenter the earth's atmosphere from greater altitudes, but most of them are so small that they burn up before hitting the ground. High-energy satellite explosions, such as that depicted in this painting, are one source of dangerous, small, man-made objects in Earth's orbital space. 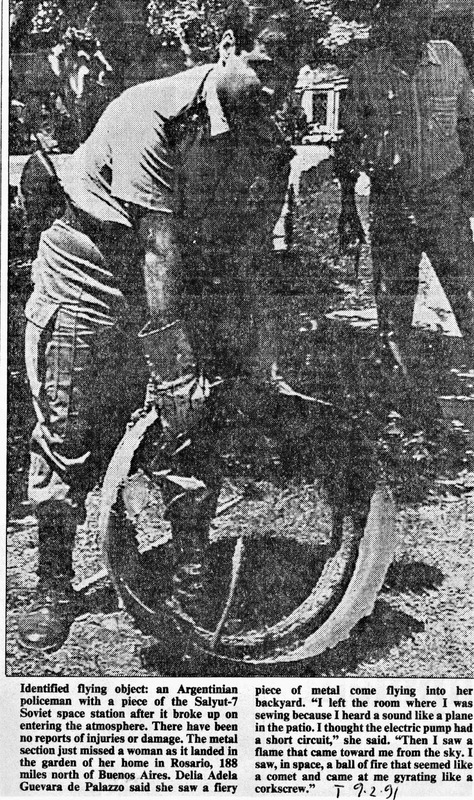 Screenshot of an Associated Press article that ran in the Ocala Star-Banner, a Florida newspaper, on Jan. 6, 1983. In July 1982, Space Shuttle Columbia, on its fourth mission, came within 13km of the spent upper stage rocket used to launch the Soviet Intercosmos 4 satellite. Although both objects were being constantly monitored and any possible collision was avoidable, it caused concern to ground controllers. After the seventh shuttle flight in 1983, one of Challenger's forward windows had to be replaced after it was struck by a tiny speck of paint that had peeled off ' from the satellite. A few months later, on July 27, 1983, cosmonauts Lyakhov and Alexandrov were working in the Salyut 7 space station when they were startled by a loud crack. Investigation showed that a 0.2 inch diameter crater had been formed on one of the windows. It was too small to puncture the skin of Salyut though it amazingly coincided with preparations for a training exercise called "urgent escape from the station." It is not known if the object which struck Salyut was a natural or artificial piece of space debris. Some disastrous impacts may already have taken place. 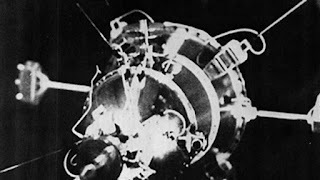 The Soviet Cosmos 1275 satellite, launched in June 1981, ceased working after only seven weeks for no apparent reason. Several other satellites are also suspected impact victims. 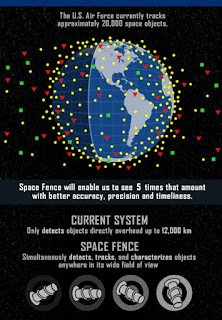 NORAD,...At the latest count there were about 6,000 trackable objects in space of which only 5 per cent were active satellites. Twenty five per cent are dead vehicles such as spent upper stages and used satellites and the rest is debris of various sizes. Most space debris comes from either the accidental or deliberate explosion of satellites. Between 1973 and 1981 seven Delta rocket upper stages exploded because of a design fault. They showered more than a thousand trackable objects into orbit of which 70 per cent remain. The Soviet Union has exploded "killer" satellites in space as part of an anti-satellite system. 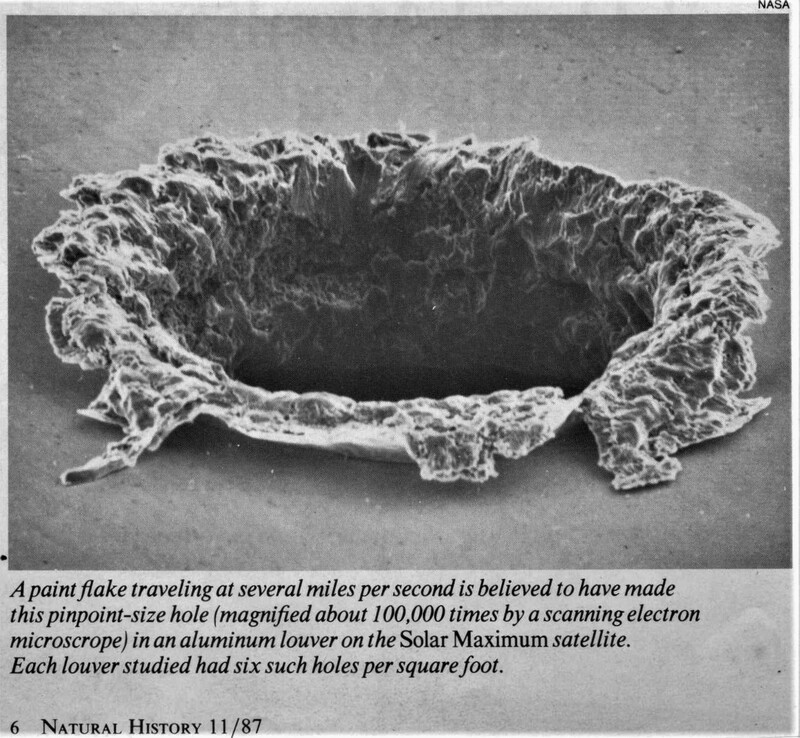 It is estimated that in total there are 10-15,000 objects of 4 cm or larger in orbit, plus countless smaller objects. 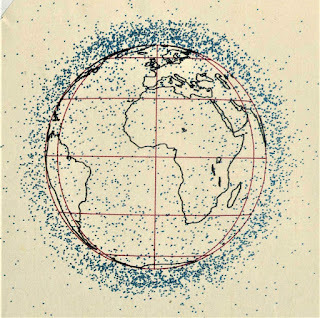 SATELLITES, BOOSTERS AND DEBRIS with a diameter of 10 centimeters or more swarm around the earth in this computerized printout by Lockheed engineers. Their printout is based on data from the U.S. North American Aerospace Defense Command. Early in 1986 a rocket belonging to the European consortium Arianespace roared skyward carrying a Spot 1 satellite. After it had injected the French remote-sensing satellite into orbit, the rocket's third-stage booster itself remained in orbit. Last November, inexplicably, the booster blew up, contributing more shrapnel to an already dense—and potentially dangerous—swarm of objects hurtling around the globe. At a time when the U.S. is planning to extend its presence in space with a renewed shuttle program, the space station and possibly the Strategic Defense Initiative space technologists are becoming increasingly concerned by the growing cloud of debris that envelops the earth. 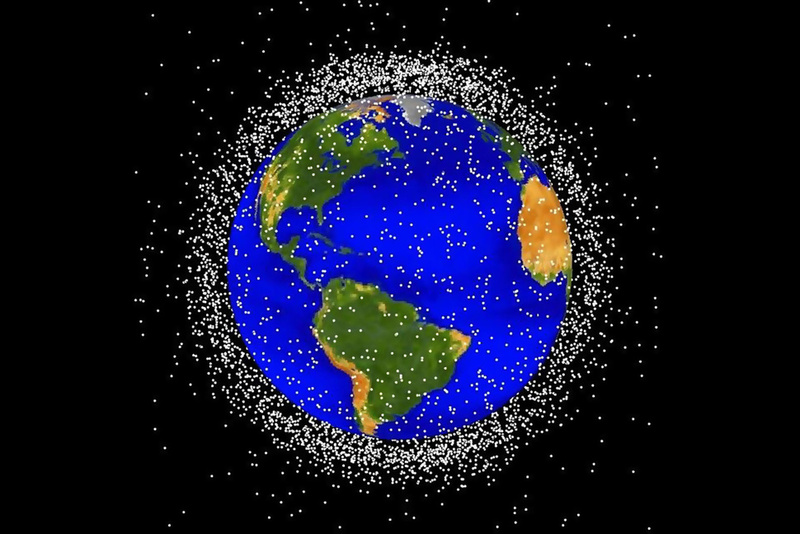 The U.S. North American Aerospace Defense Command currently tracks some 7,000 objects about the size of a baseball or larger, most of them working and obsolete satellites and spent rocket boosters. Four years ago NORAD was tracking only 4,000 such objects, according to Donald J. Kessler of the National Aeronautics and Space Administra-tion. About 40,000 fragmentary ob-jects that are smaller than a baseball and larger than a pea are also in orbit, Kessler says. A pea-size object colliding with a satellite, a spacecraft or an astronaut at 10 kilometers per second could have the destructive power of a hand grenade, according to Nicholas L. Johnson of Teledyne Brown Engineering. Even much smaller objects can cause significant damage. In 1984 the space shuttle Challenger returned from a mission with a pit about a centimeter wide in a pane of its windshield. Investigators discovered that the pane, which had to be replaced, had been struck by a paint flake only .2 millimeter wide. The U.S., says Robert C. Reynolds of Lockheed Engineering and Management Services Company, Inc., "probably has the dubious distinction of creating the most debris" with a series of Delta boosters that exploded during the 1970's. The U.S.S.R. has contributed with tests of antisatellite weapons and with the de-liberate destruction of malfunctioning satellites. 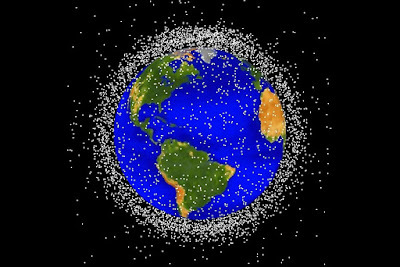 The space environment surrounding earth is becoming so cluttered up with junk that guaranteeing the security of vital weather, telecommunications, crop monitoring and navigation satellites may soon prove impossible. Manned space flights, trying to pass through this shroud of discarded and perished rockets, boosters, defunct satellites and other assorted scientific debris, will shortly also become jeopardized. These were just some of the gloomy predictions to emerge from a crisis conference of space scientists and astronomers earlier this month. 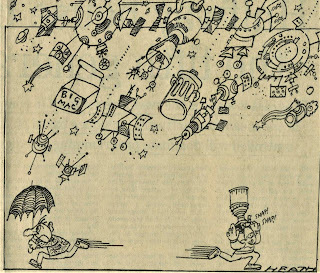 Members of the International Astronomical Union (IAU), representing current and aspirant space nations, meeting in Washington DC, heard how tiny flecks of waste measuring no more than a postage stamp could cause serious problems for an orbiting satellite or vehicle. Current estimates reckon more than 70,000 pieces of junk are now careering around the earth and the levels, say the scientists, are fast increasing. It seems as old Delta rockets and defunct Intel communication satellites collide they often shatter into fragments which whizz off often reaching speeds of up to 20,000mph. Dr John Mason, a British physicist, astronomer and consultant to the IAU's debris working party explained:"Just a pound of space junk travelling at say a modest 100mph hits a craft with the force of a 50-ton railway locomotive moving at the same speed." One scientist who believes he has at least a partial solution to the problem is Professor Kumar Ramohalli, head of Aerospace and Mechanical Engineering at the University of Arizona, in Tucson, USA. He has designed a craft to fly in low Earth orbit, which, he claims, will pick up discarded but useful materials, which a shuttle can collect later, while retrieving true waste for incineration in the Earth's atmosphere. The device is called an Autonomous Space Processor for Orbital Debris (ASPOD) and Professor Ramohalli, with more then $50,000 in NASA grants, expects the first prototype to be ready early in 1991. At the heart of the craft are two computers — one controlling a pair of robotic handling arms and the other programmed to recognise structural patterns which look like junk. "You do not want ASPOD up there going around grabbing Russian satellites imagining they are debris. Pattern recognition is very important," explained Professor Ramohalli. Spreading out from the main body are a series of arms which support reflectors made from gold acrylic. When ASPOD spots debris these reflectors unfurl and incline towards the sun complete with an array of Fresnel lenses which focus the light's infra-red heat onto the junk. "Effectively, they act like powerful solar heat cutters carving up the debris into manageable chunks". The on-board computers then direct the robotic arms to funnel useless pieces back into a hopper, which, when full, is jettisoned into re-entry orbit for incineration. However, chunks or sheets of useful reflective debris are kept and welded onto the craft's reflector arms. "ASPOD grows as it collects. 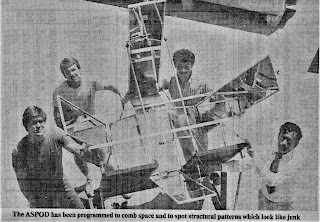 The craft starts out at about 2m in width but ends up around 5m processing a piece of junk in about an hour," said the professor. 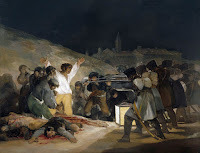 "The arms are a bit like the framework of an umbrella. You have part of the cloth covering it but not the whole lot. 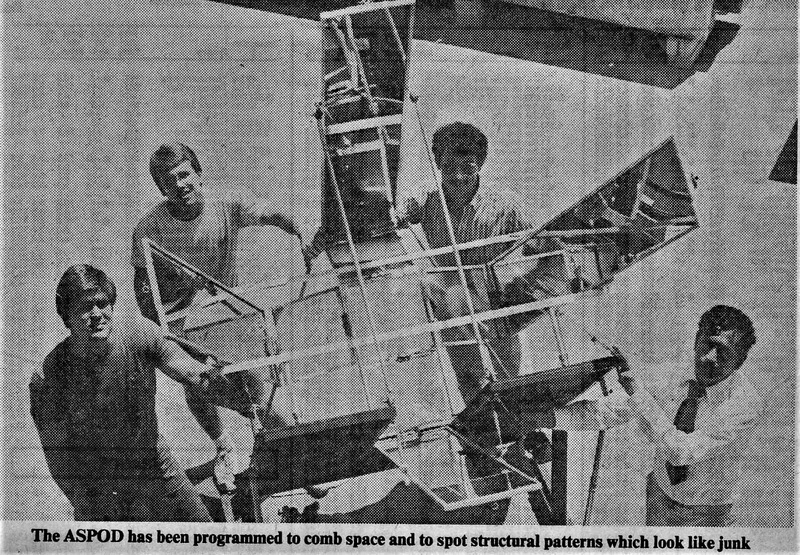 The useful pieces are just welded onto the structure for shuttle retrieval." The unique idea has already aroused the interest of several space nations. Professor Ramohalli admits his invention will not solve the increasing problems of space junk but believes it can play an important role in freeing the heavens from the worst excesses of debris. "It will not be able to handle the really tiny pieces. We expect it to be able to process junk about 10cms in size. However, with collisions occurring all the time adding to the general level of waste, ASPOD can at least help to keep down the rate at which fragments are proliferating", he said. Columbia will have a safer flight. The shroud of space debris encirling Earth has fallen for the first time since records have been kept....Recent sun flare activity has played a key role in the purge. Bil Djinis, NASA's project manager for orbital debris said sun flares in the past few months had been among the highest recorded, heating the upper reaches of the earth's atmosphere and causing it to distend and thicken. Consequently, some of the debris just beyond the upperreaches of the atmosphere, including flecks of painty, chips of metal and possibly even a pair of astronaut gloves, have been vapourised. Figures show that, as of December 29, the number of traceable objects had fallen to 6,697. In 1988 Norad put the level at 7,110 objects. 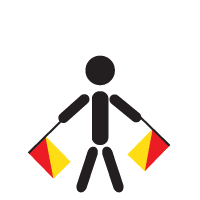 To date only one person on Earth is known to have been hit by falling junk. 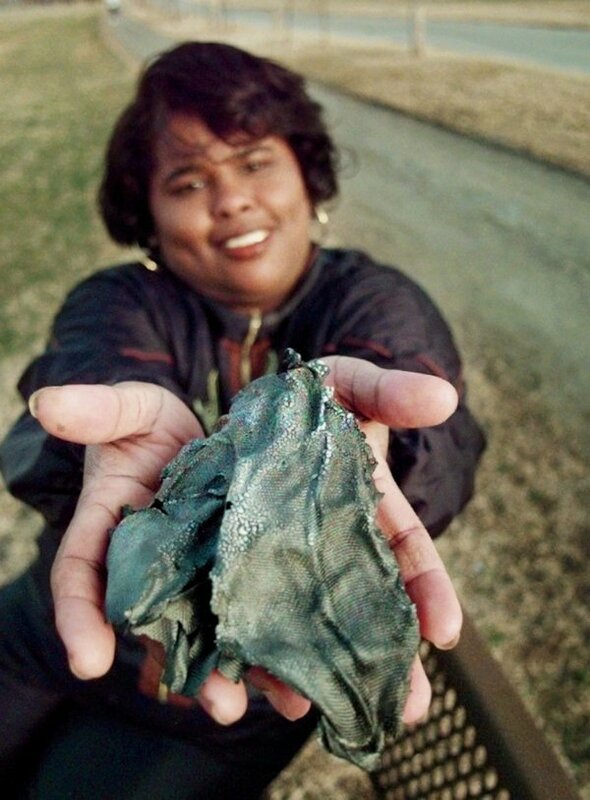 In 1997 Lottie Williams from Tulsa, Oklahoma was strolling in the park when she saw a big ball of fire in the sky. A little while later, something hit her on the shoulder. It turned out to be a small piece of burned mesh from a Delta II rocket. It was like "being hit by an empty drinks can", she said.' She told NPR: "I think I was blessed that it doesn't weigh that much," says Williams, noting that larger pieces of this rocket fell elsewhere. "I mean, that was one of the weirdest things that ever happened to me."